When you think about holiday lighting, there’s always one movie that comes to mind. Unlike the storyline in the movie, the experts at Blue Collar share some tips on how to create a beautifully decorated home safely. For trademark purposes, we can’t mention the movie about the guy in the Chicago suburbs that nearly destroys his home with unsafe excessive holiday lighting displays. It’s funny to laugh at a squirrel leaping from a tree that’s been reduced to a few bare needles by a lighting-induced Christmas tree fire, but if it was to happen in your home, you’d see quickly that it’s no laughing matter. We haven’t even factored in the people who fall off ladders and staple themselves to the roof, and we’ve already got some unbelievable holiday lighting accident stats. Never fear – we’ve got you covered. By adhering to the guidelines set forth in the Blue Collar Electricians Holiday Lighting Safety Guide, you’ll enjoy the yuletide season safe and sound! Rule #1: If you’re heading up, make sure your ladder is grounded! Make sure that your ladder is secure and that you aren’t near any power lines. Rule #2: Make sure your lights are UL inspected. That little UL logo on the wires and tags isn’t there as a decoration. That means that the Underwriter’s Laboratory inspected that piece of equipment and has stamped it with their approval. Rule #3: STOP…It’s NOT Hammer Time! Don’t use hammers, tacks or nails to hold down wires or secure strings of lights. Purchase some inexpensive clips to hang your cords instead. Rule #4: Use GCFI outlets for your inflatable Santas. GCFI outlets break the current when there are differences in the hot and neutral current, which prevents shock. Rule #5: Remember the extension cord scene in the movie? Use only heavy-duty outdoor extension cords and plug no more than three sets of lights into each one! Rule #6: Stay in the clear. When you are working indoors, keep your cords away from drapes, furniture and carpeting. Rule #7: Don’t get tripped up! Keep cords in low traffic areas and avoid walking on them or kinking them as that could lead to worn cords and dangerous situations. If you remember the movie, the poor cat got zapped when it chewed on the cord. Unplug the cords when they aren’t in use and spray lemon juice on them to help deter your pets from chewing on them. If you are worried that your home isn’t prepared for holiday lighting, call the pros at Blue Collar Electricians. We’re available for holiday lighting inspections to make sure that you are on pace for a safe and sound holiday season. 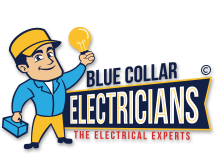 Schedule your lighting inspection today with Blue Collar Electricians!